WeedMD and Phivida Sign Definitive Agreement on Cannabis Beverages Inc.
TORONTO, CANADA, August 15, 2018 – WeedMD Inc. (TSX-V:WMD) (OTC:WDDMF) (FSE:4WE) (“WeedMD”) and Phivida Holdings Inc. (CSE: VIDA) (OTC.PHVAF) (“Phivida”) are pleased to announce the signing of a final definitive joint venture agreement (“Agreement”) to develop and operate Cannabis Beverages Inc. (“CanBev”) at WeedMD’s state-of-the-art greenhouse facility in Strathroy, Ontario. As an early mover in the cannabis-infused beverage market, CanBev is positioning itself to capture significant market share in Canada’s highly-anticipated consumable cannabis market. The launch of CanBev creates an opportunity for CBD-infused products to enter the consumer health products market. This consumer health products market is worth $5.6 billion in Canada alone based on data from Consumer Health Products Canada. The joint venture will be focused on product development, manufacturing, marketing and distribution of cannabis-infused beverages for Canada and export to licensed international markets. Click here for an introductory video on the CanBev joint venture project. 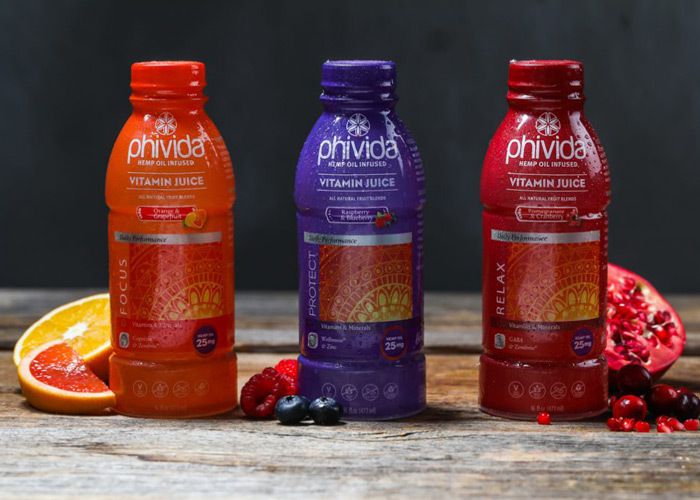 “The Phivida team is excited to contribute our management, expertise and product knowledge to the CanBev joint venture,” said Jim Bailey, CEO and President of Phivida. “WeedMD is an ideal partner for Phivida and we are thrilled to bring our cannabinoid-infused beverages and brands back home to Canada. WeedMD provides CanBev with solid infrastructure, strong management, world-class genetics and proven success in the Canadian healthcare market. We are very proud to partner with best in class among the Canadian licensed producers.”. Phivida [“fiii-vee-daa”] infuses CBD derived from Hemp into functional foods, beverages and health products. Phivida uses encapsulated cannabinoids from hemp oil into water soluble form, enhancing bioavailability, and timed released within the body. Phivida’s CBD beverages, foods and supplements contain a proprietary blend of phytonutraceuticals studied to target a range of health conditions, from chronic pain, treatment of stress and anxiety to reducing inflammation in the body. The World Anti-Doping Association’s recently lifted a ban of CBD from hemp oil and the World Health Organization’s recent statement supports clinical benefits of CBD for athletes and active families. Celebrating; Health and Wellness, In Harmony™, Phivida’s vision is to lead the market as the benchmark quality standard in premium CBD infused foods, beverages and clinical products, with a dedication to research, education and investing back into the communities we serve. Phivida is a publicly traded company listed on the Canadian Securities Exchange under the ticker symbol “VIDA” and the OTCQX Market as “PHVAF”. Join our social media network @Phivida. For more information, access our updated investor presentation here and corporate video here.